Let’s face it you are either a candle lover or you are not – there simply is no in-between. Obviously, you are a candle lover because you are at this article. Floating candles make an amazing centerpiece as well as provides aroma for your home. Follow our step-by-step instructions and you can create your own floating candles. Step 1: Melt your candle wax according to the manufacturer’s instructions. Step 2: Add 3 to 4 drops of the scented candle oil to the melted wax and carefully stir. Step 3: Pour the melted candle wax into your mini muffin pan. Step 4: Insert a wick into each floating candle, and allow the wax to cool. 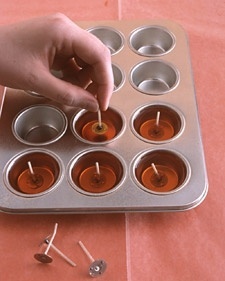 Step 5: Flip your mini muffin pan upside down, and carefully remove your floating candles. DIY floating candles do not require any special skills or tools. Have fun playing around with different colors of wax and different scented oils. As always, while working with a hot material take necessary precautions to prevent burns. Show off your candles by placing them in a clear bowl with water and lighting.